On the surface, a disposable paper coffee cups seems simple enough. It’s just a vessel you can use to serve customers with a delicious drink. However, when you start to examine coffee cups from a business perspective, you begin to recognise their potential as a powerful promotional vehicle. Paper cups are versatile and easy to carry around, which makes them a natural solution for when you want to get your brand name out there with the help of your customers. When your cups are carefully designed, you can rest assured that every time someone leaves your business with a fresh cup of Joe, they’ll be showing off your organisation to the world around them. So how do you design disposable paper coffee cups that make the right impact? Which colours you should use for your takeaway coffee cups can be a difficult decision to make. After all, you want to pick colours that stand out from the crowd, but you also want to pay attention to current trends in the marketplace, and potentially make your cup beautiful enough that your clients will want to snap pictures of them for their social media feeds. The best way to get started when choosing colours is to think about your brand logo and the shades that you use to advertise your business elsewhere. This will help you to choose a design that naturally resonates with your existing identity. Remember, make sure that you don’t choose colours that clash, or blend easily together, particularly when you’re writing messages on your cups that you want future customers to read. Anything else that needs to be written on your coffee cups. Sans-serif fonts are generally the more friendly and modern option. At the same time, remember to ensure that your text is big enough to be read from a distance – particularly when you’re writing your business name on your cups. Finally, you won’t always want to put an image on your cup, as this can overwhelm the design and make it too busy. However, you may choose to display your logo on your high-quality disposable paper coffee cups to improve brand awareness. The key to success with images on your coffee cups is making sure that you choose a design that’s refined enough to work well on a range of different sized cups. You don’t want your logo to seem blurry or pixelated when on a particularly large cup, or a small espresso container. At the same time, it’s important to choose a company to print your coffee cup that has the right technology available. Here at Pureco China, we pride ourselves on our stunning flexographic printed logos and artwork. Our printing methods deliver exceptionally clear and smudge-free images every time. Ready to start working on your disposable paper coffee cups? 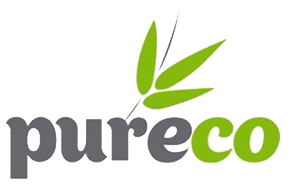 Contact PureCo today! This entry was posted in Custom-Made Coffee Cups and tagged disposable coffee cups, disposable coffee cups with lids and sleeves, paper coffee cups wholesale, what are disposable coffee cups made of.